See here for the film: https://www.youtube.com/watch?v=m8270xcUZNY. 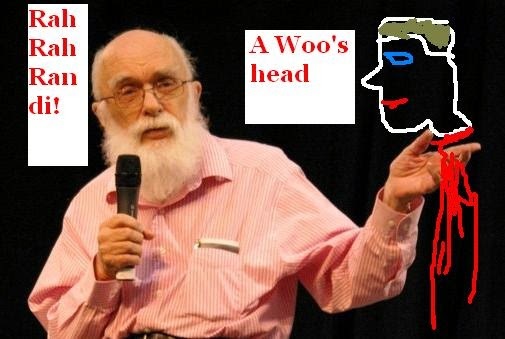 James Randi has announced that he has resigned as president of the James Randi Educational Foundation. The statement looks factual and straightforward, but, as we must always ask when dealing with Randi, is everything as straightforward as it seems? See here for background: http://hpanwo-voice.blogspot.co.uk/2014/11/randi-in-crisis.html. See here for the film: https://www.youtube.com/watch?v=I-qhcpG1bW4. Zombies are well-known figures of mythology and horror fiction, and their profile is steadily increasing in recent books and films. However more and more they have been appearing in the media and in official government publications portrayed as real or semi-real. What’s going on? The answers... and more questions... will be revealed. This film contains disturbing information and is not suitable for small children. See here for more details: http://hpanwo-voice.blogspot.co.uk/2014/11/zombie-update-november-2014.html.